If you're a regular blog reader, I'm sure you've seen similar posts, scenarios if you will, about what we might chat about or what I might say if we sat down and had coffee together. I think these can be fun. Maybe fun isn't the right word choice exactly. But maybe it is? They're transparent, showing who the blogger really is ... if they're being honest of course. It's not often you truly get to sit down with the person behind the blog. I would first let you know that I'm not a super fan of coffee. I drink mine with hot cocoa and it's mostly out of habit rather than the need for caffeine. I could forgo it on the weekends entirely. Since we're talking coffee, I would also let you know that I've never ordered coffee from Starbucks and only once from a true coffee shop. I've only been into 2 Starbucks shops - the original in Seattle and one in town where I ordered a bottle of tea when meeting a friend. I would let you gasp and then laugh at me of course. I'd tell you some weird facts about myself like the fact that I have this odd obsession with wanting to own a goat farm so that I can make cheese. Note, I've never made cheese in my life nor lived on a farm nor do I want to be out of the city. I'd want to know what fun dream you've had rolling around in your head, too. That way we could both feel less weird right? But come on - goats! But the goat farm isn't all, I have all sort of grandiose ideas bouncing around. I believe I mentioned that in another post. I'm a dreamer, a thinker, less of a doer. I love being creative, making and creating things that someone else might enjoy. That makes me feel useful I suppose. I'd let you know that's why I make the jewelry or the scarves. It's something to do with my hands that I'm actually creating, crafting and it can make someone else smile or feel special. That makes me realize that my career path totally took on it's own trajectory somewhere along the way when I wasn't looking. I'd want to know if that happened to you. How did you end up on your career path. In talking with others, I have found that few feel as if they're where they belong. That's sad to me. So we may end up having a deep discussion about careers, choices we've made, where we feel we got off track. We could talk endlessly about our dream jobs, careers, those things that ignite a passion, that make you swell with pride and you want to talk about for hours. At that point I'd confess another oddball idea that I have bouncing around (I have plenty to share). 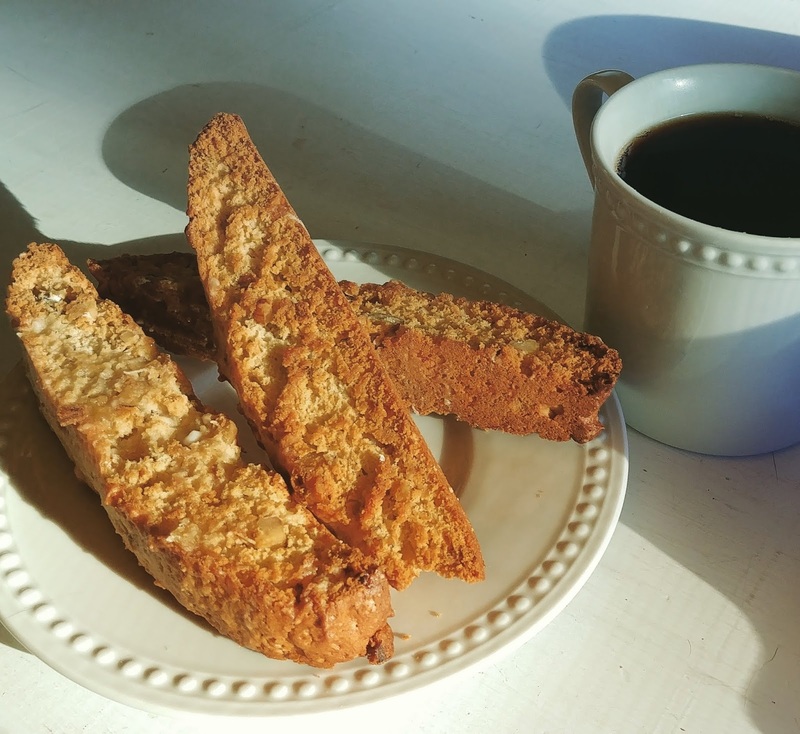 I want to make and sell biscotti. Huh? Yep, I know. Another oddity. I love baking. In my mind, I'm not a baker. I don't want to have a bakery. I worked at one when I was 18 and man that's not what I really want. But I love to bake and I narrowed it down to biscotti. Rational? Nope. That's ok though right? I'd also let you know that I haven't had a doughnut since I worked at that bakery. And we won't mention how many years ago that was. Your turn - what would you want to talk about over coffee? Do you even like coffee? And what's your favorite biscotti flavor? That one is a must tell! How fun on the chocolate chip cookies! I mean, go with what you do best right???? I have made an orange, walnut & chocolate biscotti that turned out really well, but I want to tweak it just a smidge. Thanks for reading! I love reading your coffee thoughts!! I love that you drink your coffee with hot cocoa stirred in, I wonder if I could get Scott into coffee if I tried that trick? Why didn't I think of this sooner?? Me on the other hand - I love coffee, love the ritual of it, the taste of it, love everything about it! Oh and I could drink it all day and still go right to bed with no problem. AND - I love the idea of a biscotti-only coffee shop. The possibilities would be endless for flavor combos, YUM! Definitely worth a try to see if Scott may like coffee that way!! I also like my coffee cooled off, which I know is odd for most people. What can I say??? LOL I was also thinking tea could go well with the biscotti - especially with a citrus biscotti. This was a 2 am thought .... oof.